An ongoing challenge in the USA is that our transportation infrastructure is aging. Typically major bridges were built more than 50 years ago and increasing traffic has resulted in load limits being placed on many of them. In many states, annual bridge inspections are required by law and federal regulations require interstate bridges and overpasses to be inspected every two years. In the present technological world, bridge monitoring does not have to rely exclusively on periodic human inspections, but can rely instead on electronically monitoring a bridge's health. This approach could expose a structural integrity problem well before detection via visual inspection. That would make it possible to select which bridges need a more detailed and immediate inspection so that they can be maintained and repaired well before any deterioration could lead to a collapse. In a relatively short period of time, the cost of instrumenting a typical bridge can offset the cost of periodically sending an experienced inspection crew to that bridge. The civil engineers having the responsibility of keeping the infrastructure reliable should become aware of sensor products available that will aid them in evaluating infrastructure conditions. Typically, there are three categories of sensors used for bridge monitoring. Strain gages measure stress loads in bridge members that can be detected as micro displacements. Second, inclinometers measure gravity-referenced shifts like tilt, twisting, or bending. And third, linear position sensors measure macro movements of bridge elements like rocker bearings and gusset plates of trusses. Buckling or tearing of the gusset plates has been identified as one of the most serious structural problems in older truss bridges. Because the sensors needed by bridge monitoring systems have to operate for a long time in extremely harsh environments, not all position sensors are suitable for these stringent applications. One sensor that is currently being successfully used incorporates contactless inductive technology that offers better stroke-to-length ratio than LVDTs, and eliminates the contact wear problem found in resistance potentiometers. These sensors are offered with aluminum or stainless steel housings, cable or connector electrical terminations, and can be mounted in a variety ways with readily available hardware. Being weather sealed, they can operate over the wide temperature ranges found in the blustery winters of the northern reaches of the US, the dry, hot summers of the southwest, and the hot and humid conditions of the southeast. With integral electronics, they produce an analog dc voltage or a 4 mA to 20 mA current-loop output. 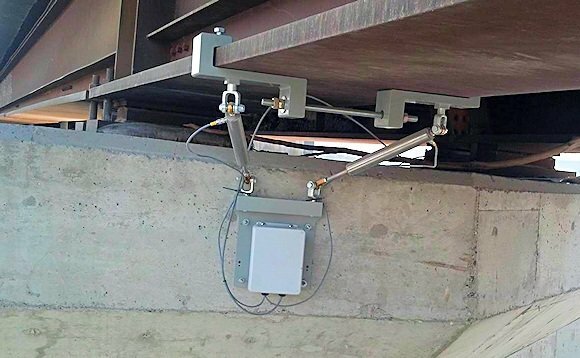 Connected to an appropriate data acquisition system, these linear position sensors can monitor the movement of key structural elements of a bridge like rockers or gusset plates and transmit the data over a remotely accessible wireless network, where it can be recorded and analyzed. 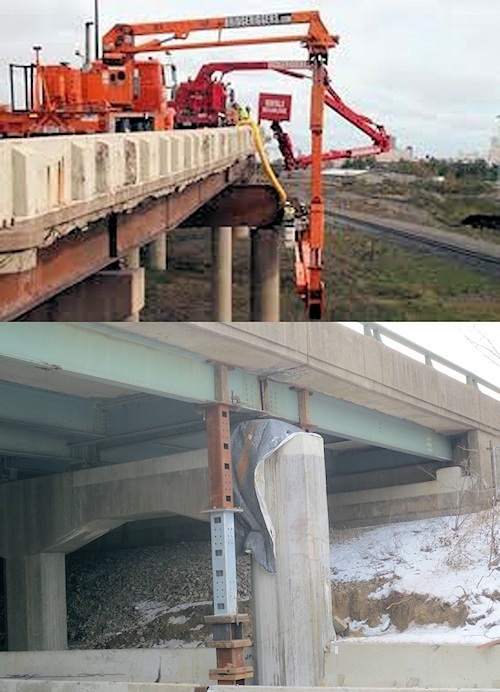 In figure three, two Alliance Sensors Group's LV-45 series inductive linear position sensors are attached to a highway bridge and its supporting pier with rod-eye swivel ends to allow them to measure movement of the bridge relative to the pier and rockers in all three axes over time and ambient temperature. Fig. 3: Inductive linear position sensors keep tabs on subtle and extreme bridge movements. Their outputs are processed by a data recording system that periodically updates an off-site monitoring station by cellphone-network based transmissions. These sensors have been in service for many months, during which time they experienced the expected seasonal environment variations while providing valuable information to the engineers. Edward E. Herceg is currently Vice President and Chief Technology Officer of Alliance Sensors Group, a division of H. G. Schaevitz, LLC. He is highly regarded for his applications-engineering expertise and technical innovations, and is well known as the author of the Schaevitz Handbook of Measurement and Control. Before joining ASG, he held senior technical and marketing positions at Everight Sensors Corp., AST Macro Sensors, and Schaevitz Engineering.